Macau online casino websites - Is online gambling legal in Macau? Macau is the casino mecca of the world, overtaking Las Vegas as the global leader in terms of annual gambling revenue, with money earned from gambling tourism responsible for 50% of the region’s economy. But where does Macau stand when it comes to online gambling? We look at Macau’s gambling laws including online gambling to determine whether it is possible for players from Macau to place real money bets over the Internet. Macau’s gambling industry has a long, rich history dating back to the mid 1800’s when gambling was first legalised. Around the year 1850, the government approved and charged rent to owners of 200 fantan (Chinese gambling) houses in an attempt to boost the economy, and the success of the scheme paved the way for the thriving casino industry Macau enjoys today. Macau is now home to over 30 high-end land based casinos, including some of the biggest and most famous casinos in the world. A majority of visitors to Macau hail from Hong Kong or mainland China, where gambling is illegal, although Macau’s casinos are also frequented by tourists from other Asian countries and elsewhere around the world. Macau’s land based casinos are a hot spot for junket operators and proxy betting, which the government is struggling to regulate. Once a colony of Portugal, Macau is now part of the Peoples Republic of China, although it operates as a special administrative region which is subject to its own set of laws and regulations. The main legislation responsible for regulating the gambling industry is the Macau Gaming Law (Law 16/2001) which provides the legal framework for all commercial gambling operations including casino games, lottery, sports betting, horse racing, electronic gaming machines, gaming credit law and junket commissions. Under Macau Gaming Law, all forms of gambling are legal and regulated except bingo and online gambling. Individuals must be at least 21 years old to enter Macau casinos. Who is responsible for regulating Macau’s gambling laws? The authoritative body responsible for overseeing the regulation of the gambling industry is the Macau Gaming Inspection and Coordination Bureau (Direcção de Inspecção e Coordenação de Jogos), known as the DICJ. The DICJ’s duties include to supervise and monitor the activity of gaming commissionaires and promoters, identify any breaches of the law and apply a relevant penalty, and ensure the relationship between the government, commissionaires and the public are consistent with the best interests of Macau. In Macau it is legal to gamble online on horse racing, greyhound racing and sports betting, but things get a bit confusing when it comes to online casino gambling. Macau Gaming Law specifies the commercial operation of online gambling is allowed by any privately owned entity, as long as it has been granted a license to do so from the government. The catch here is the government of Macau has not yet issued any online casino licenses, so technically, no online casino vendor has legally been given permission to operate within Macau. Unlike China, Macau does not restrict access to overseas gaming websites, so there is nothing in Macau Gaming Law to restrict players from playing at offshore online casinos. Lots of offshore casinos accept players from Macau and many residents of Macau continue to frequent foreign-run online casino sites without breaking any immediate local laws. The lack of regulation applied to online gambling in Macau is odd for a region so tightly dependent on gambling money, and many industry insiders speculate the government may crack down on online gambling in light of any changing laws over the coming years, but for now, players can access overseas casino sites from Macau with no legal issues. Despite Macau running as its own special administrative region, its close association with China (where online gambling is strictly forbidden) means some online casino vendors choose to avoid servicing this region entirely. For a list of the best online casino sites accepting players from Macau, refer to our casino table at the top of this page. This table has been geo-targeted to recognise your location and only recommend the top-rated casino sites allowing players from your country. Given online gambling is not regulated in Macau, it is important for players to stick with reputable, licensed offshore venues that have been licensed by trustworthy online gambling jurisdictions. If you are concerned about your security when playing at an online casino, consider using a trusted VPN (virtual private network) service for an added layer of security. 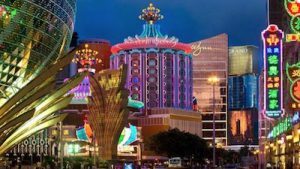 If you’re a foreigner planning a visit to Macau, read our guide to Macau’s land based casinos for more information about the famous integrated resorts and gambling venues to frequent.